Born in Kumano City, Mie prefecture in 1950 to a mother from a long line of dyeing teachers, textile dyeing is definitely in Yusai Okuda's blood. After first learning the intricacies of painting and engraving, Okuda went on to study both Western and Japanese garment design, and Kyoto-style dyeing techniques. In 1980, he created the Yusai Dyeing Laboratory in Kyoto and perfected a number of new techniques throughout the decade, before rediscovering the long lost art of Korozen dying in 1990! During the Heian period (794 to 1185), Emperor Saga decreed that Korozen was to replace purple as the color for formal garments used at royal ceremonies. Korozen is characterized by truly amazing hue changes such as those seen in an opal. Known also as the 'dye of the sun', madder red appears the moment light passes through it. 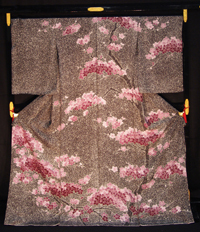 The dyeing technique was handed down from generation to generation by a few select artisans, and was the color exclusively worn by emperors on solemn occasions. However, all knowledge of the Korozen recipe was eventually lost. Shrouded in mystery for centuries, Okuda unraveled its features, and finally succeeded in reproducing it following an in-depth study of the garments worn by former emperors, which are preserved at Koryuji temple in Kyoto. Yume-korozome features a new color which is more appealing to the modern eye, while maintaining the dignity of the original Korozen. It changes color from black to deep red, from dark blue to burgundy, from green to brown, or from brown to reddish brown, constantly concealing and revealing! Okuda believes that this fabulous phenomenon is part of Japan's color culture where, for instance, the beauty of the changing seasons is highly appreciated. Expressing the beauty of ever-changing nature can be called a special aspect of Japanese culture. Okuda considers Yume-korozome a technique born of the aesthetic value placed on color change by the Japanese. Absolutely unique, Yume-korozome, an exquisite dye, is something Japan can proudly present to the world.